The Conservatives will not set a deadline for their target of slashing immigration but hope to do it as quickly as possible, ministers say. Their manifesto includes a commitment to bring net migration down to below 100,000 even though the pledge, first made in 2009, has never been met. Brexit Secretary David Davis said it would be done in an "economically viable" way. UKIP said the lack of detail was "taking the public for mugs". Labour, who have themselves been accused of not wanting to set any limits on immigration, said the Conservatives' plans were unrealistic and uncosted. The pledge to reduce net annual migration - the difference in the number of people coming to the UK for a year or more and those leaving - to the tens of thousands was in the 2010 and 2015 Tory manifestos. Neither Theresa May nor David Cameron has come close to meeting it as prime minister. The most recent figure was 273,000. The last year it was below 100,000 was 1997. Despite this, the target has been retained in the 2017 manifesto, which states the party will deliver "controlled, sustainable migration" but does not set a timeframe. Pressed on this, Mr Davis told the BBC it was a "major policy imperative", but suggested the details of how it would be achieved had still to be worked out. "We're not setting a timetable on it," he said. "We need to do it in a way which looks after the economy but also delivers on what people wanted when they voted in the referendum." Former Chancellor George Osborne, now editor of the London Evening Standard newspaper, has said his party "haven't a clue" how they will meet their migration target. In an editorial, Mr Osborne also criticised Theresa May's refusal to spell out the impact reducing migration to below 100,000 would have on the economy. "Either ministers know the damage their immigration policy will do, but won't tell us; or they have deliberately avoided finding out, because they know the answer will be negative," he said. But Conservative candidate Kwasi Kwarteng told BBC News said everything about Mr Osborne should be "viewed through the lens of his brutal dismissal" as chancellor by Mrs May. "He has many axes to grind," added Mr Kwarteng. 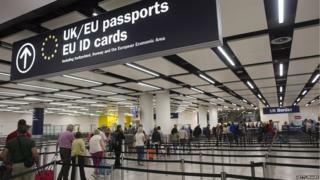 Ministers say the decision to leave the EU, which will bring an end to current free movement rules, will enable the UK to exert full control over its borders. But they have stopped short of guaranteeing this will lead to a fall in migration from the EU. Mr Davis said he wanted to fulfil the net migration pledge - which also has implications for migration from outside the EU - "expeditiously" but in a way that protected the economy. "The aim is to do it in a way that doesn't cause labour shortages, that allows us to train people up to do the jobs, that encourages businesses to employee British skilled workers. "We're telling the public what we want to do, you know we're not writing a detailed contract to buy a house, we're writing a major policy imperative which we will do in a way which will deliver the best for British society." On Wednesday, defence secretary Sir Michael Fallon said it was the Conservatives' "ambition" to continue to get immigration down, pointing to new proposals to increase the levy on firms hiring foreign workers. He said there would be a cost to the economy, but this had not yet been calculated "because we do not know specifically what year we are going to reach that point" of hitting the target. UKIP's immigration spokesman John Bickley said ministers were trying to "brush off" questions, and that the lack of detail about their plans was staggering. "I looked at their manifesto and actually I couldn't find the immigration section at first - it's at the back end of the manifesto, it doesn't even have a chapter heading," he told Radio 4's Today. Shadow chancellor John McDonnell said some independent assessments had put the cost of meeting the target as high as £6bn and Conservatives were "falling apart" under questioning. "Our immigration policy will be managed but it will be fair but based upon the needs of the economy," he told a press briefing in London. "We will not undermine our economy on the basis of setting unrealistic targets." Liberal Democrat leader Tim Farron told the Press Association: "It is a reminder Theresa May has set immigration targets throughout her time as home secretary and now as prime minister, and has failed to meet them. "It is about the Conservatives now being basically UKIP."